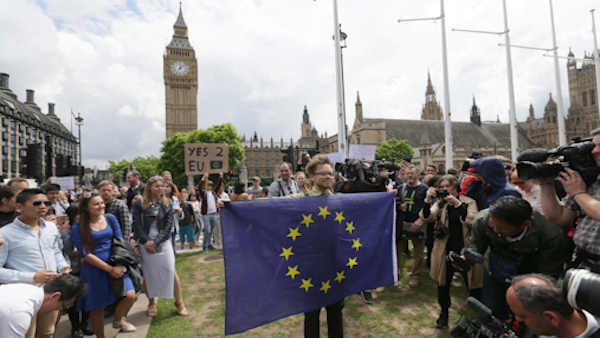 LONDON -- Scotland's Parliament could attempt to block Britain from leaving the European Union, the Scottish leader said Sunday as the turmoil following the historic referendum spread and the leader of the opposition Labour Party faced an open revolt in his party. Scottish First Minister Nicola Sturgeon, determined to keep Scotland inside the EU, said on BBC that she would consider advising the Scottish Parliament not to give "legislative consent" to a British exit, or Brexit. She said withholding Scotland's consent might block Britain's plans to leave the union. Voters in Scotland and Northern Ireland backed staying in the EU in Thursday's referendum, but the role of Scotland's Parliament in a final decision has not been made clear. "I find it hard to believe that there wouldn't be that requirement," Sturgeon said of the need for Scotland's approval. "I suspect that the U.K. government will take a very different view on that and we'll have to see where that discussion ends up." Sturgeon's Scottish National Party does not enjoy an outright majority in the Scottish Parliament - created in 1998 as part of the devolution process - but she emerged from the EU referendum unscathed. The opposite is true for the leader of the British opposition Labour Party, Jeremy Corbyn, who is under increasing pressure to step down because of the referendum result. The Labour Party advocated remaining in the EU but many party insiders say Corbyn's lackluster campaigning did little to promote the party's cause. Thus far, the pressure on Corbyn comes from his "shadow cabinet," a British institution in which the main opposition party designates senior figures to advisory positions, such as "shadow chancellor" or "shadow health secretary." Its members advise the leader on what policies Labour should embrace. Seven members in the shadow cabinet resigned Sunday after Corbyn fired shadow foreign secretary Hilary Benn overnight. The dissidents want Corbyn, who represents the far-left wing of the party, out of the picture before the next general election, which may happen sooner than expected because of the Brexit turmoil. Shadow heath secretary Heidi Alexander released her resignation letter Sunday after stepping down. Corbyn did not respond publicly to the coordinated assault on his leadership, but senior allies said he would remain in the leadership role and that he still has strong support among the party's rank and file members. Prime Minister David Cameron has said he will resign when a new leader of the Conservative Party is chosen at a party conference in October. It is possible the new party leader, who would become prime minister, would call a "snap election" to validate his or her position. Corbyn's opponents want a different leader in place in case that happens.